It is possible for you to be asked to compare two or three maps in IELTS writing task 1 (academic paper). IELTS map comparison tasks are not common but if you get them, you must be prepared. Below is an example of a task with three maps. The maps below show the changes that have taken place in Meadowside village and Fonton, a neighbouring town, since 1962. Source: The above map was not created by IELTS Liz. Here are some questions to help you decide how to write your task 1 map report to compare maps that show change over a period of time. 1. What tense will you use? 2. What changes can you see in the maps? Choose the relevant features from the list below. 3. Find the grammar or vocabulary mistakes in the following sentences. Each sentence may one or more mistakes. a. In 1962, there was a small road travelling through Meadowside village which was replaced by a main road in 1985.
b. Another main road was also constructing from the southeast to southwest in 1985.
c. A superstore is building in the west, south of the main road and housing state 1985.
d. There is currently business park which is locate between Meadowside and Fonton, opposite the station. c is the correct answer. We use the present perfect when writing about something that started in the past until now. All features are shown except for d (industry) and g (location). You are doing stunning work for us who are dependent for their IELTS preparation on websites mainly on your’s. Specially, I am really grateful to you for your wholehearted effort. Would you please add more examples!!! the overall in process and map. The overview is THE MOST IMPORTANT PARAGRAPH. which tens is better ? As you can see, they are in the past. Thank u liz, really i appreciated u for helping those students . who want to pass ielts exam. There’s a typo in the instruction, FYI. The map illustrates the alteration between Meadow side village and Fonton from 1962 up to now. The two places generally contiguous due connected for the adequate transportation. Overall there has been considerable development in Meadow side village which was build up such as supermarket, housing and complex, while in the Fonton has been development the railway and main road connected Meadow side village. 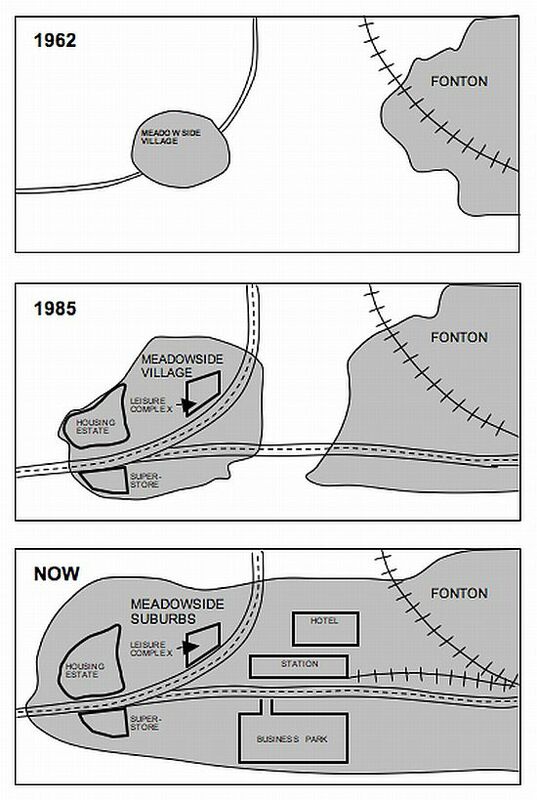 The picture illustrate about the developing places between Meadowside village and Fonton from 1962to present. Based on the maps, the two places are generally connected with each other due to the augmentation of public transportation. In 1962, both Meadowside village an Fonton stay at the opposite place of each other which Fonton was in the North east and the Meadowside was in the Northwest and the dimension of Fonton was quite hug than the opposite one. The public transportation of the Fonton was a bit modern than the Meadowside because it had train transportation which means that economic growth was in higher level than the Meadowside. Obviously in 1985, there were hug of changing in Madowside village whch was built up some building such as housing estate, super store, leisure complex and also the increasing of number of road to other neighbouring town which was lead the economic run faster. Up o present, there are more construction which is built for example like the station, hotel, sunness park and lots of lead to increase more roads and make these both places to become one. how can I get more map questions for practice? See this page: http://ieltsliz.com/ielts-sample-chart-for-writing-task-1/. All pages are listed on the main pages which you can access through the red nav bar at the top of the website. If there is no compass rose/icon on a map can we still use the terms north/south/east/west? Sure. You can presume that north is directly upwards. The maps illustrate the developments that have been taken place in two neighbouring towns( Medowside and Fanton),and particularly happened in 3 different years. Overall,Meadowside village is the town which has got more developments than Fonton in 1962 and 1985. Although they were connected with each other by a main road which was constructed in 1985. Also they are more closer now by some common facilities developed in the centre of both towns. Sorry, I don’t provide writing feedback. liz I realy excited with you detail explanation of ielts before i had no any information .But now atleast i can try.